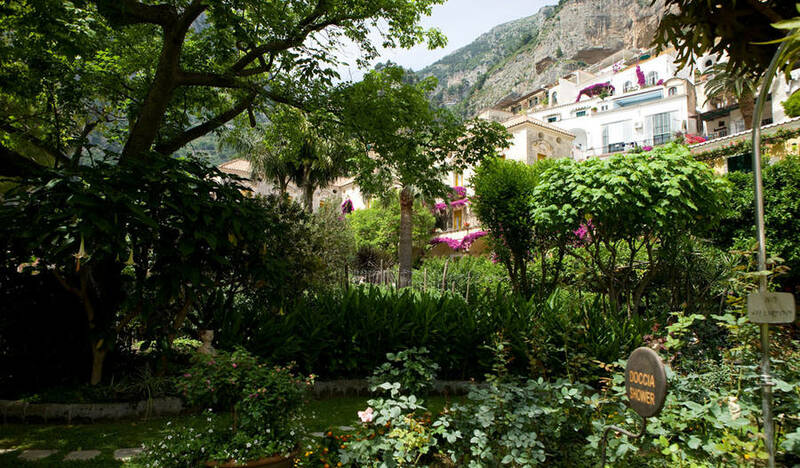 As they walk through the tiny little lanes of Positano, curious visitors might just spy a doorway, partly hidden behind great cascades of pink bougainvillea, beyond which an exquisite garden, illuminated by a thousand candles, can be seen. 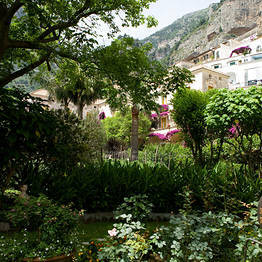 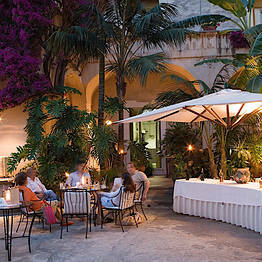 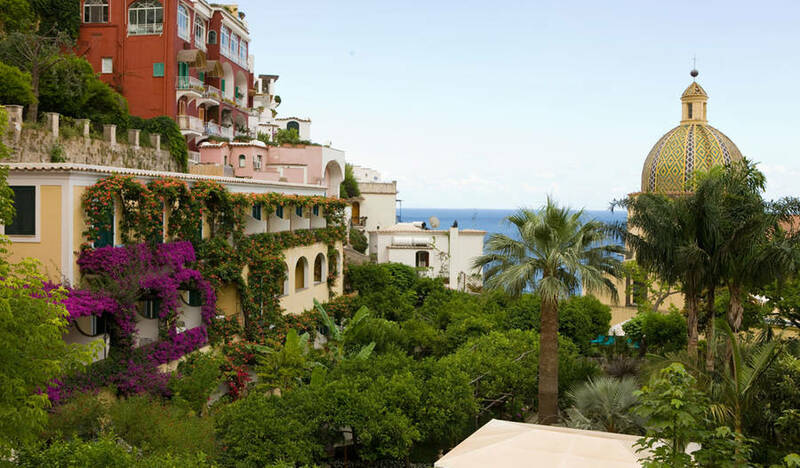 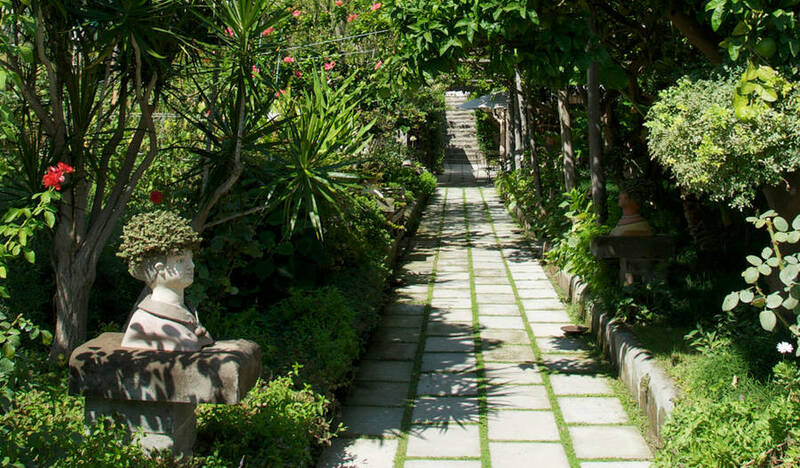 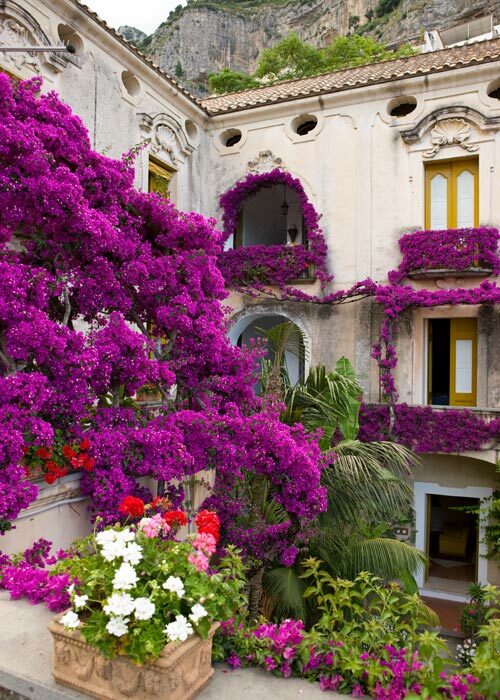 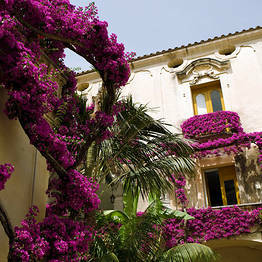 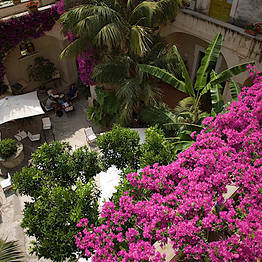 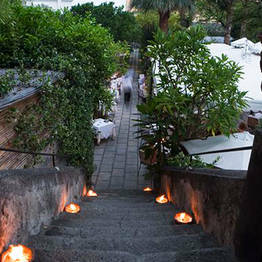 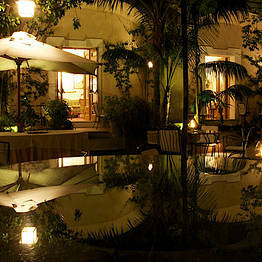 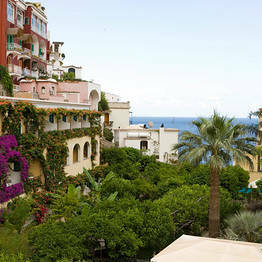 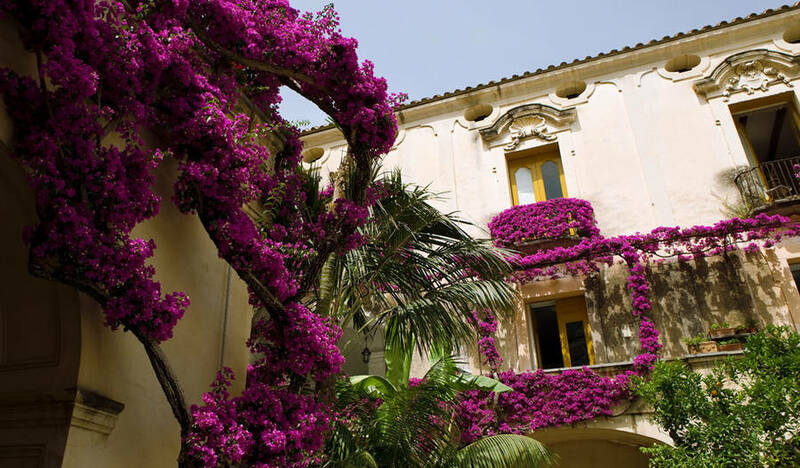 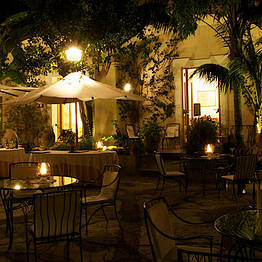 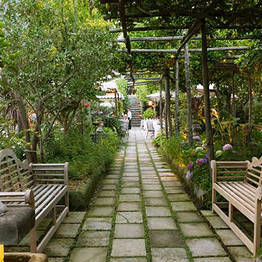 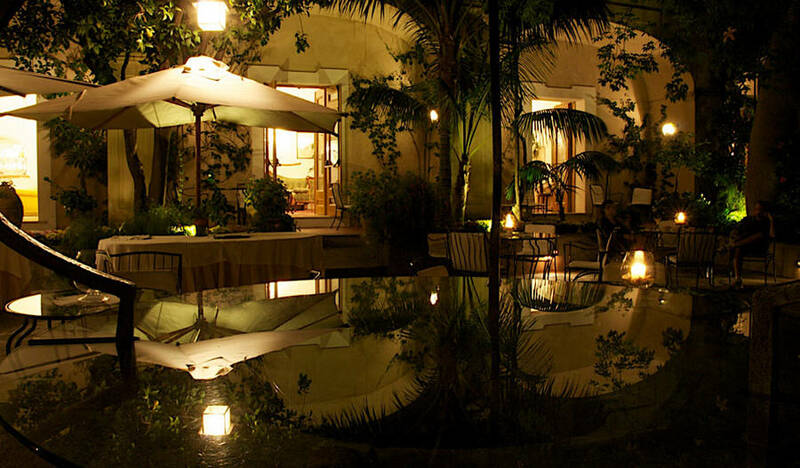 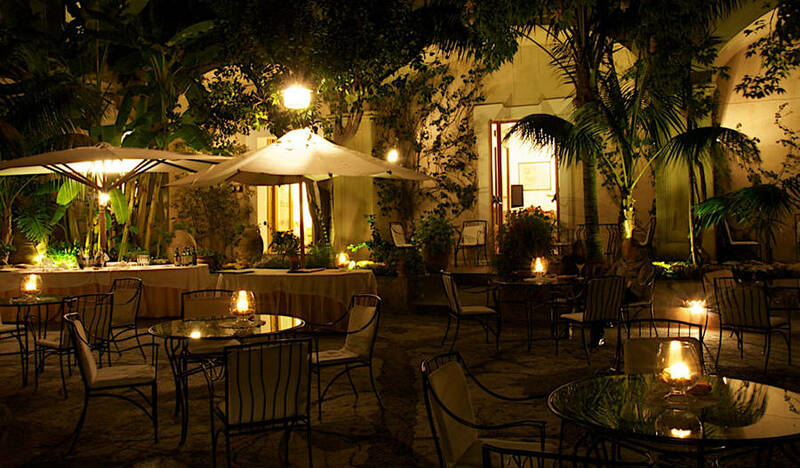 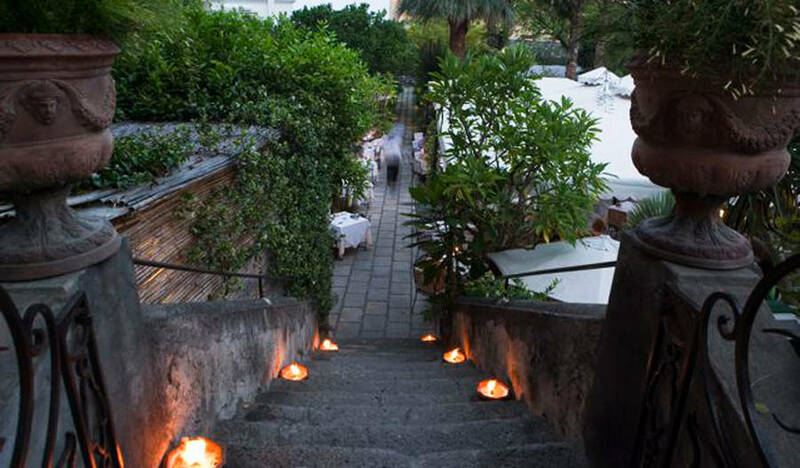 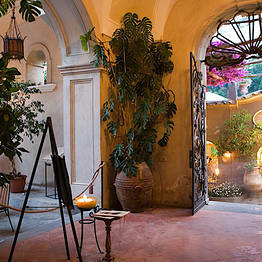 The garden surrounds Palazzo Murat, one of Positano's most exclusive hotels. 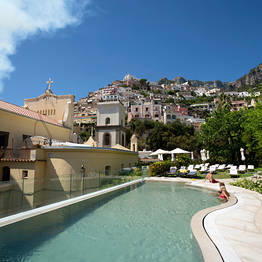 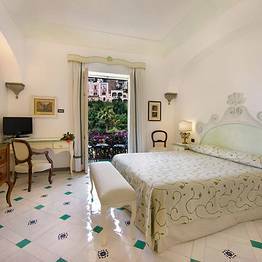 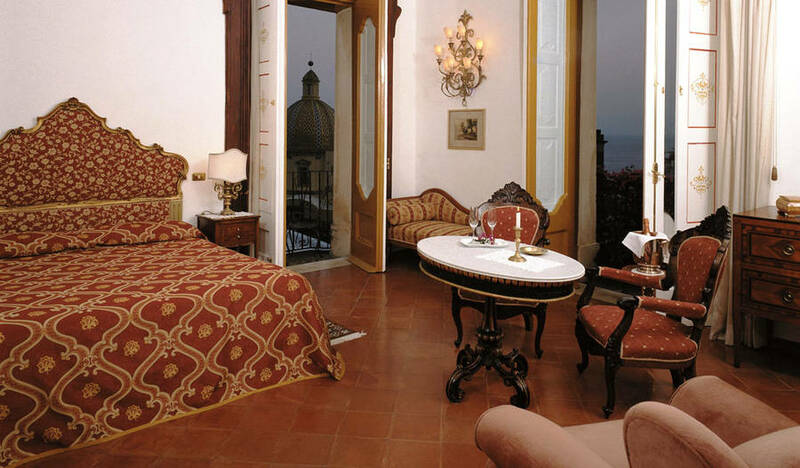 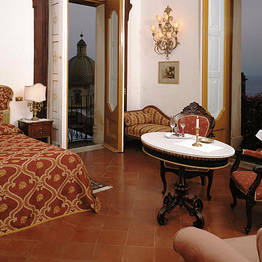 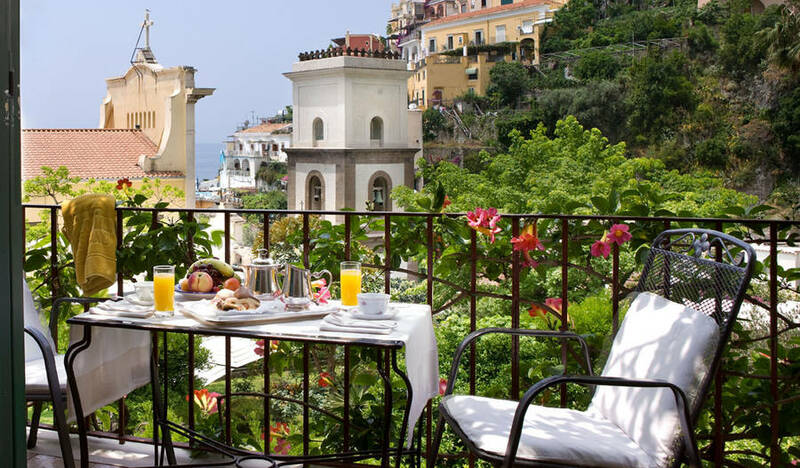 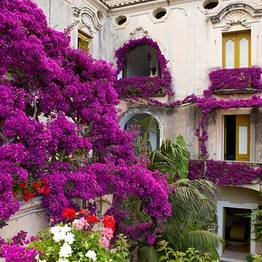 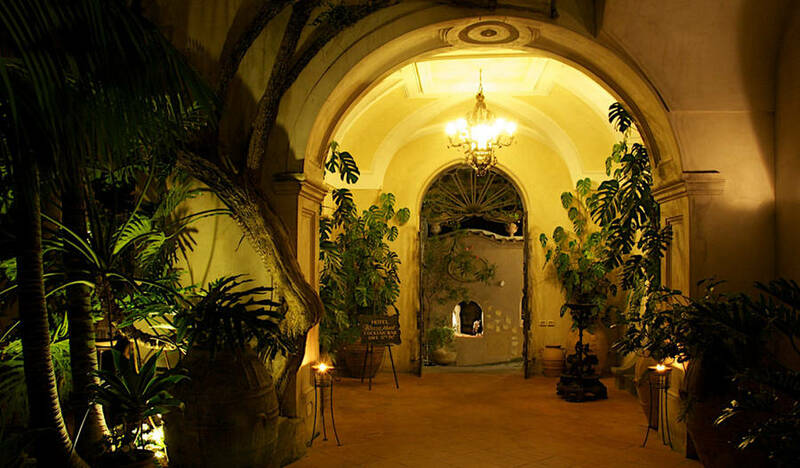 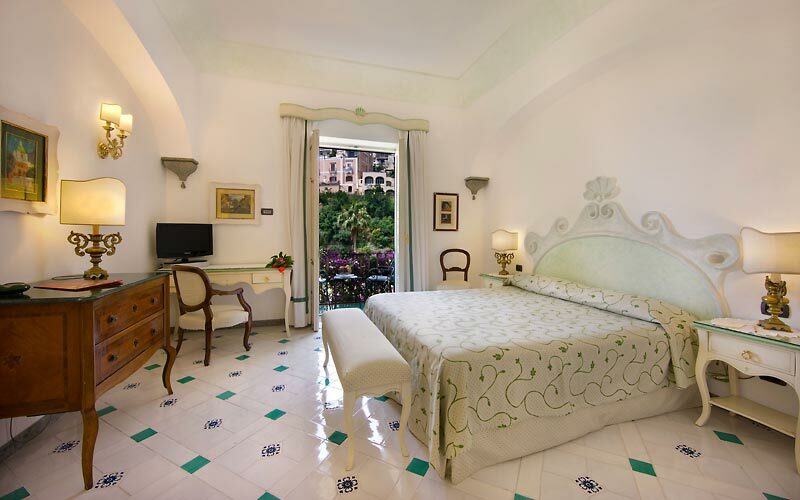 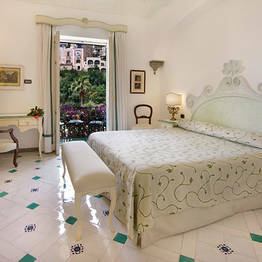 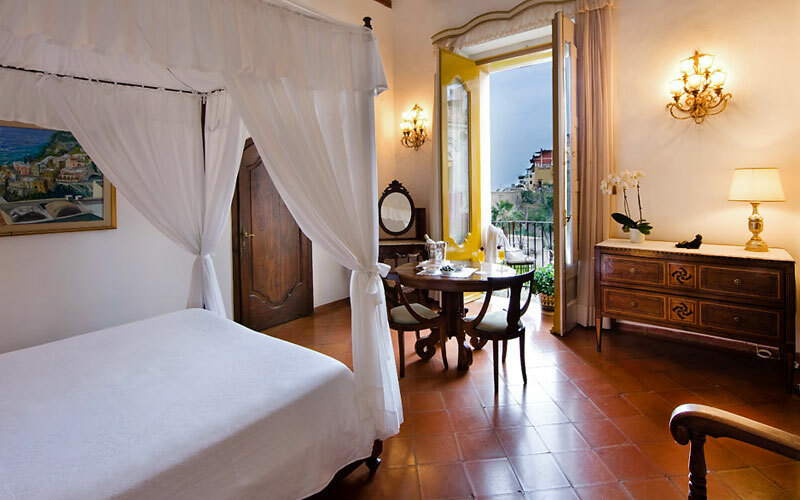 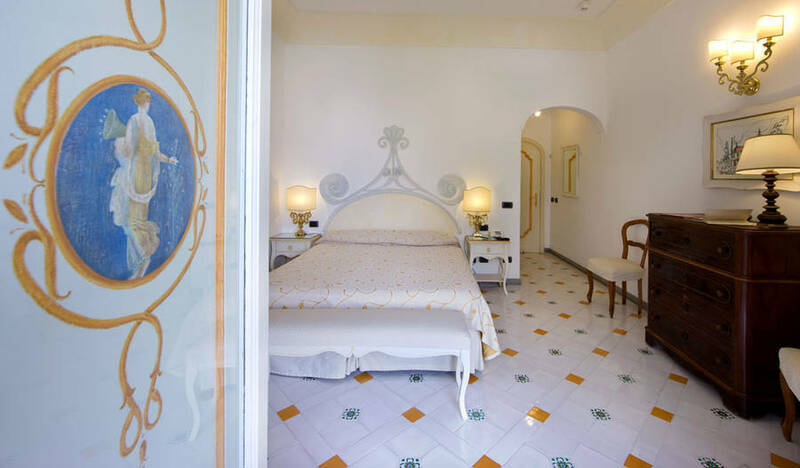 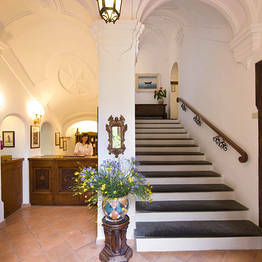 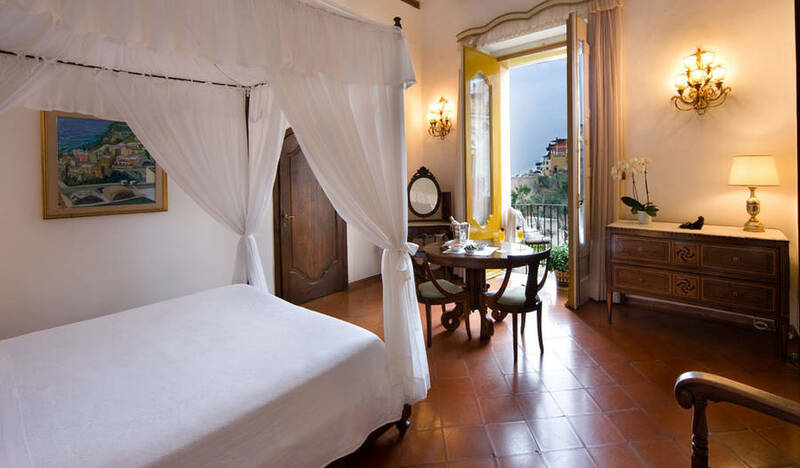 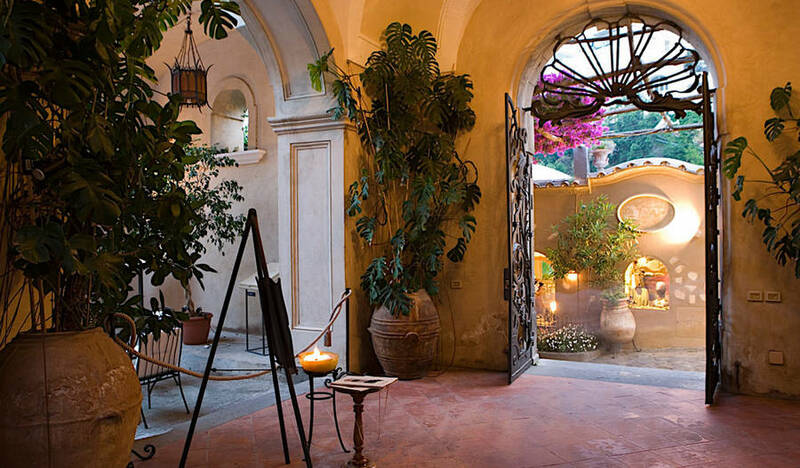 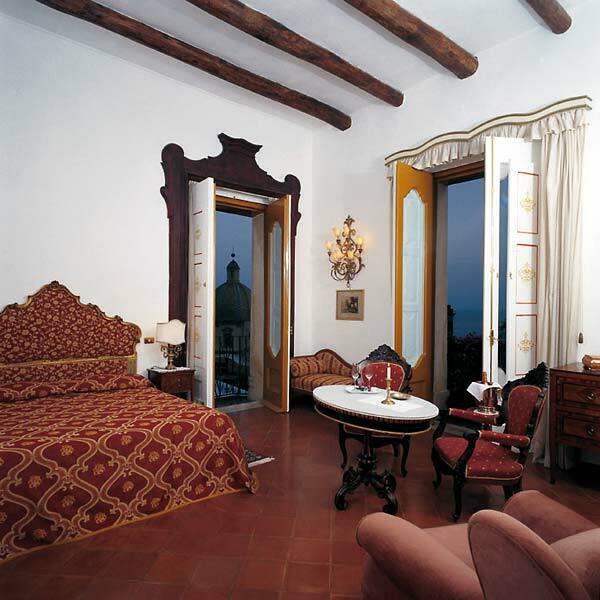 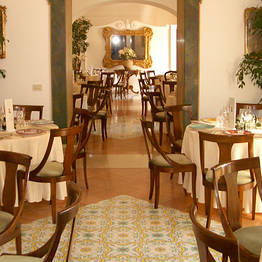 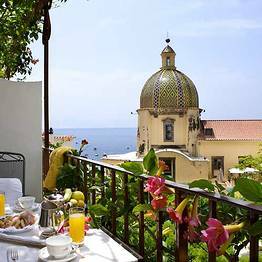 Of all the hotels on the Amalfi Coast, Palazzo Murat is one of the oldest and historically significant. 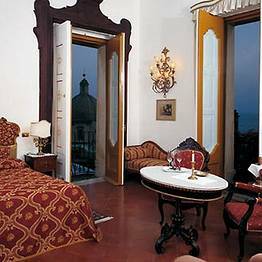 The palazzo, built in Neapolitan baroque style in the 18th century, was the summer residence of Gioacchino Murat, King of Naples and brother-in-law of Napoleon. 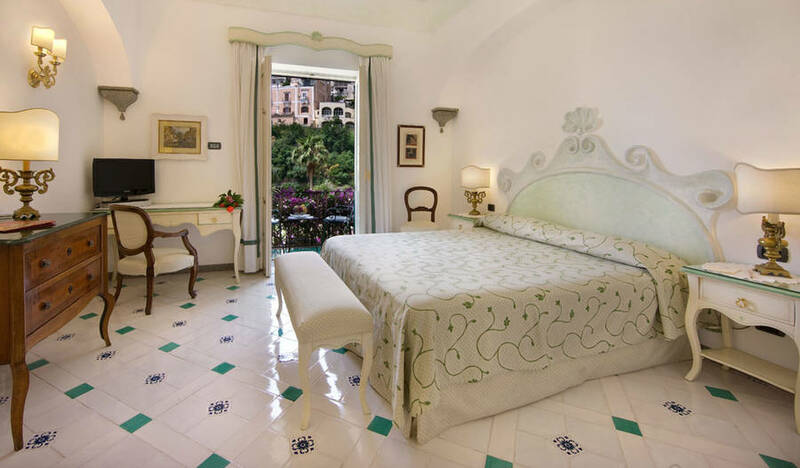 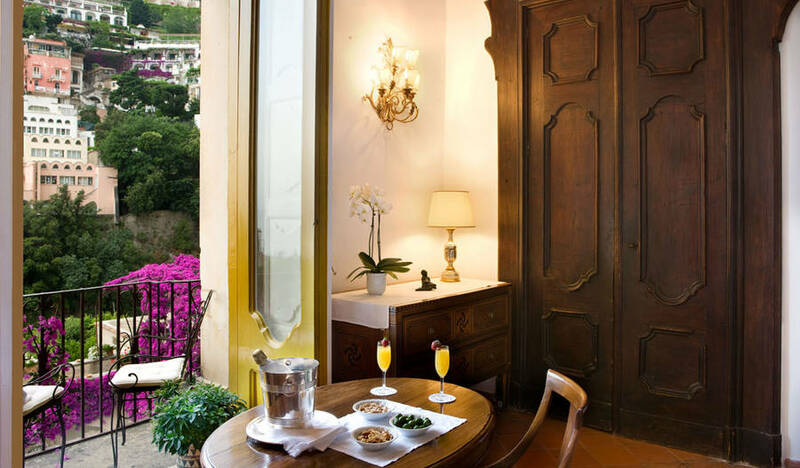 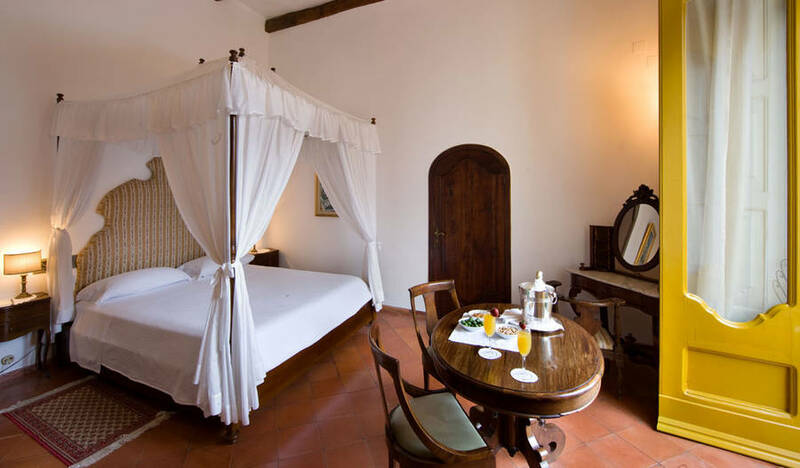 An atmosphere of centuries past still lingers in Palazzo Murat's bedrooms and suites, all of which are furnished with exquisite antiques and open out onto a balcony or terrace from where charming views of Positano can be seen. 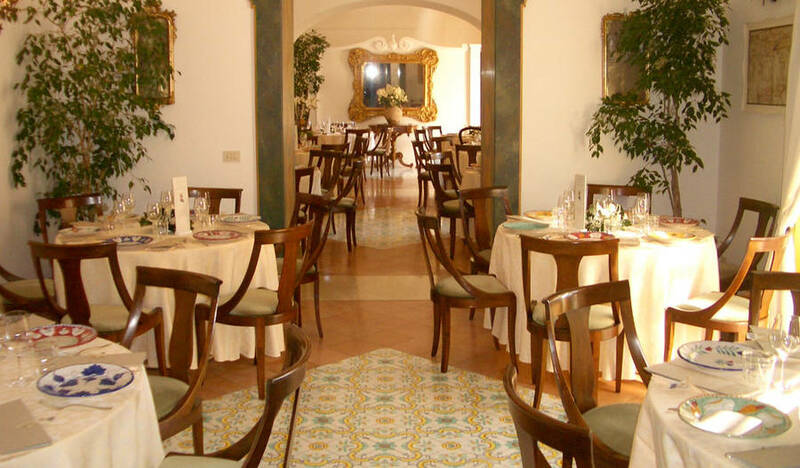 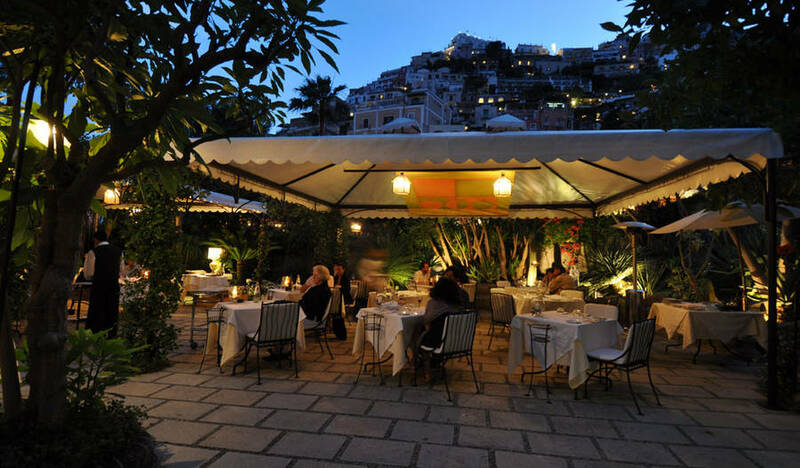 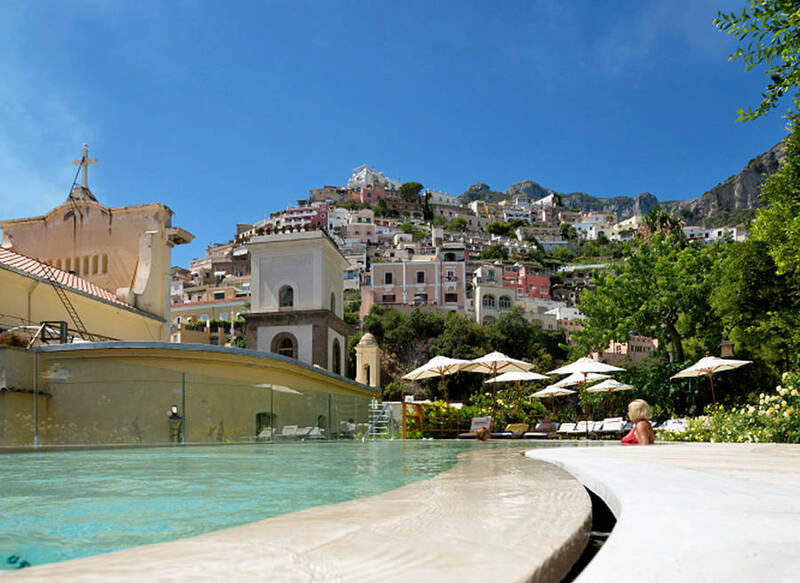 For generations the hotel has been managed by Positano's Attanasio family, who have been responsible for the addition of the small "Al Palazzo" restaurant. 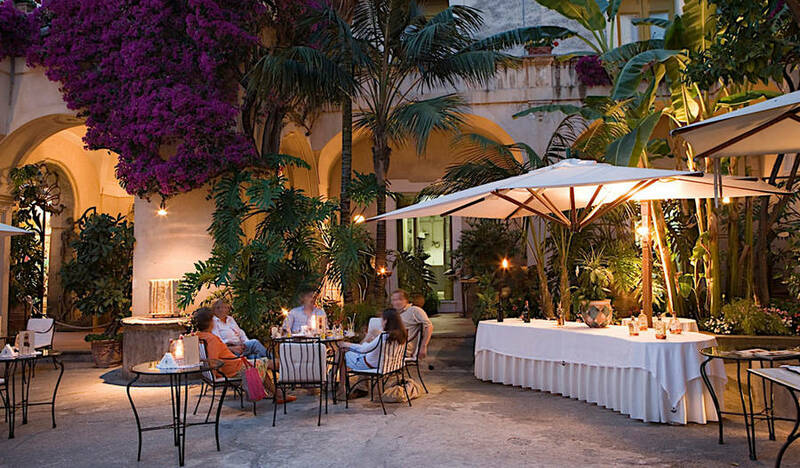 Here, guests dine by candlelight looking out upon a stunning view of the town and the majolica-tiled dome of the Church of Santa Maria. 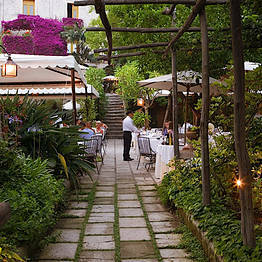 The citrus fruits, vegetables and herbs used in Al Palazzo's delicate Mediterranean dishes are the products of the kitchen garden created by Donna Carmela. 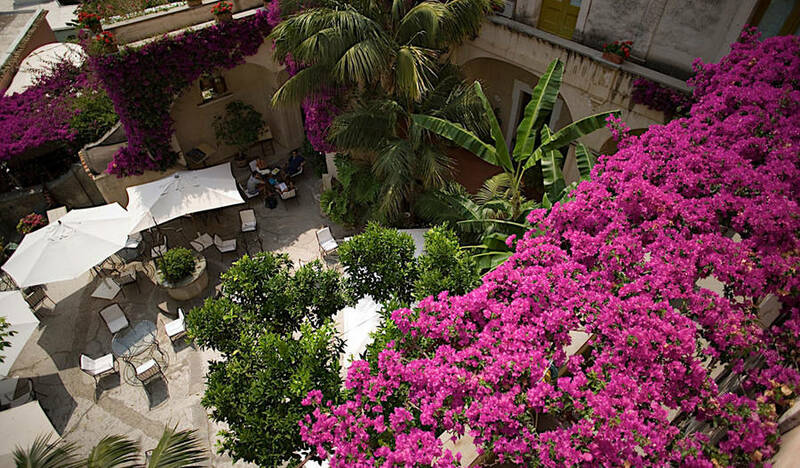 On request, Palazzo Murat provides an exclusive venue for intimate marriage ceremonies, vow renewals, and parties, which take place in a private wing of the botanic garden. 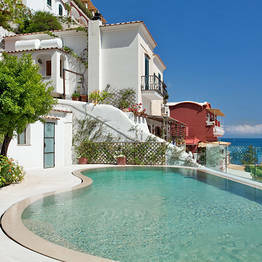 Fancy a swim? 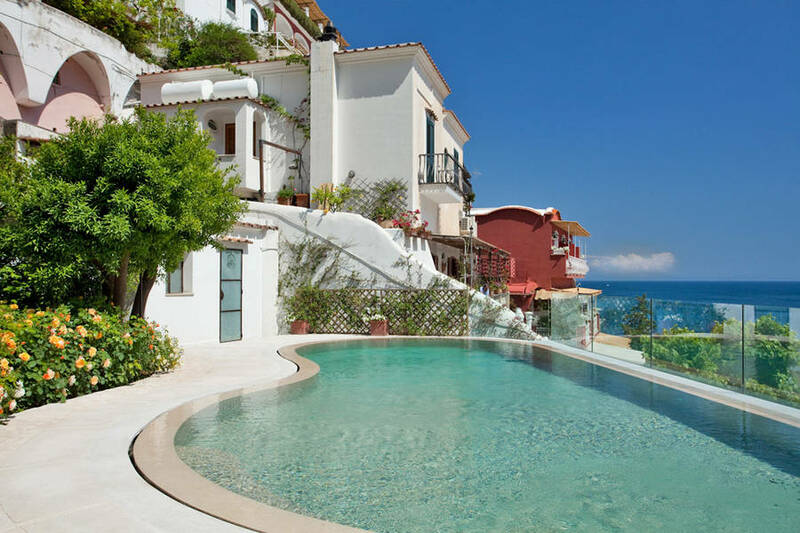 You'll love the brand new pool in the garden! 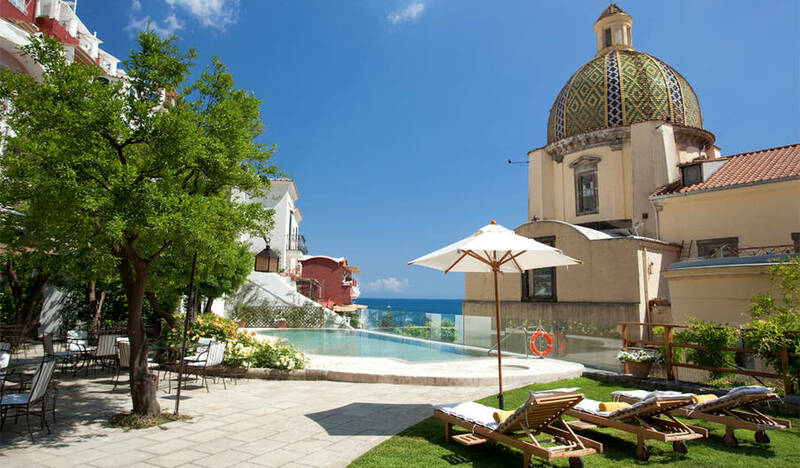 All of the most charming corners of Positano lie within easy walking distance of the hotel, including the Spiaggia Grande, the town's main beach. 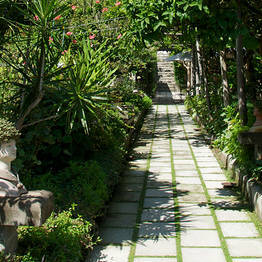 From the Spaggia the panoramic 'Sentiero degli innamorati' (lovers' walk) leads to the secluded beach of Fornillo. 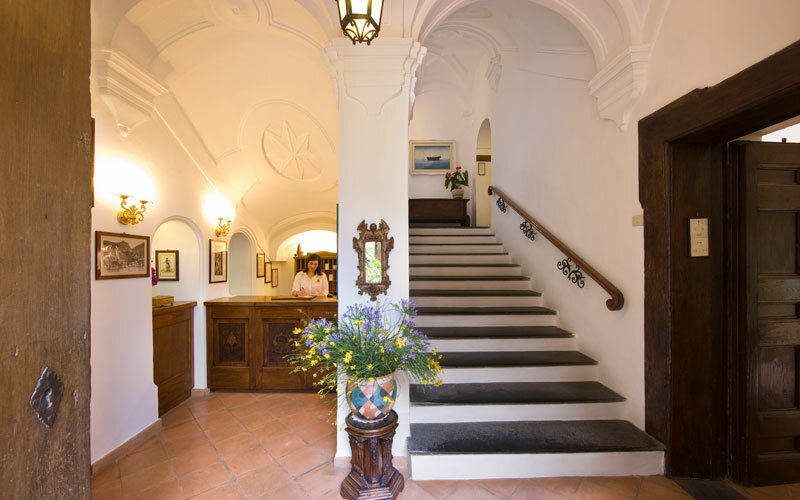 Guests keen to explore the Amalfi Coast's enchanting little coves and inlets, many of which are only accessible from the sea, can do so aboard Palazzo Murat's traditional "gozzo" boat. 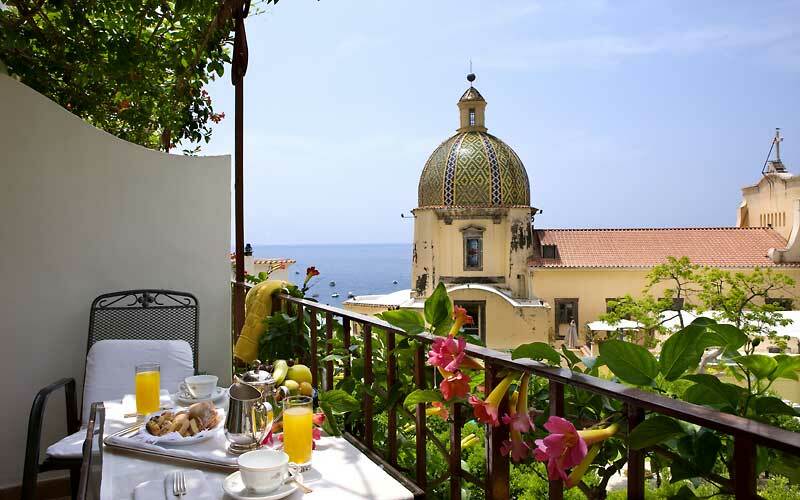 "The breakfast of delicious, freshly baked cakes, served in the beautifully-kept garden, was excellent..."
"Although the hotel is right in the center, inside it was really peaceful and you could easily forget the crowds of tourists just outside. " 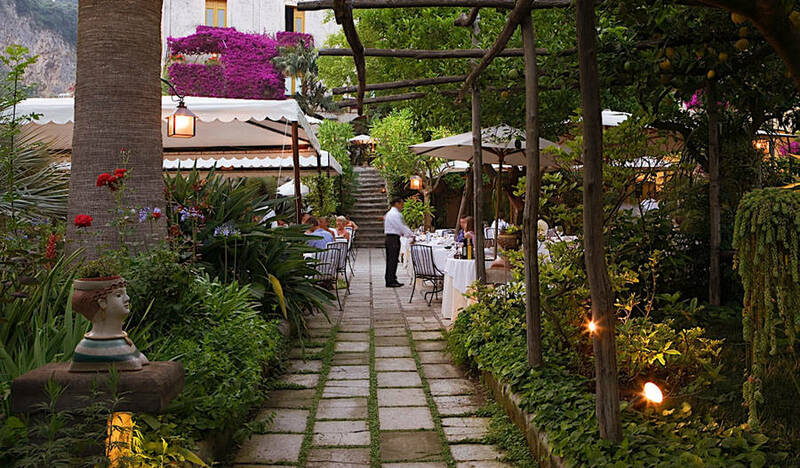 "We loved eating in what was once the family's kitchen garden: delicate yet flavorsome cuisine made with the highest quality ingredients and flawless service. " 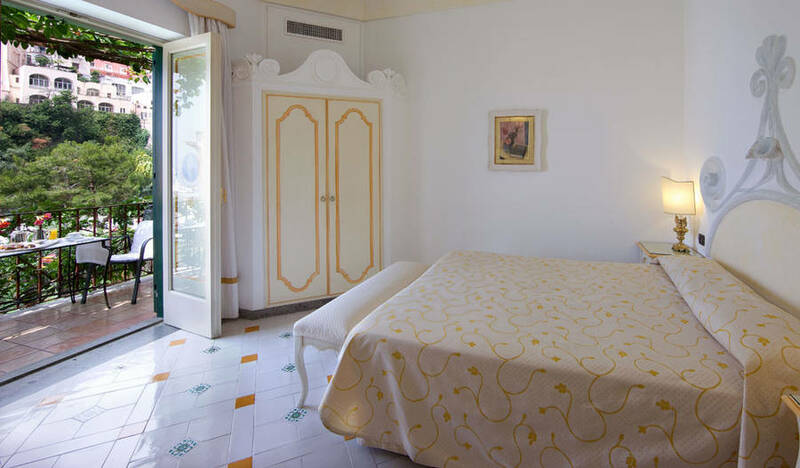 "The room was spotlessly clean (bathlinen was changed twice a day) and each evening we returned to find goodnight chocolates and a card with the next day's weather forecast on our pillow." 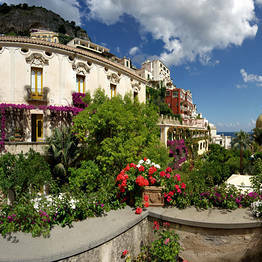 "The view from our bedroom terrace, overlooking the orange and lemon trees, the dome of the church and the houses of Positano was a real dream.... "
"Palazzo Murat is an enchanting hotel... everything is perfect: the location, the bedrooms, the atmosphere, the service "
"We loved it and will definitely be back. 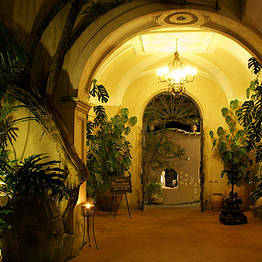 The hotel is intimate and enchanting. 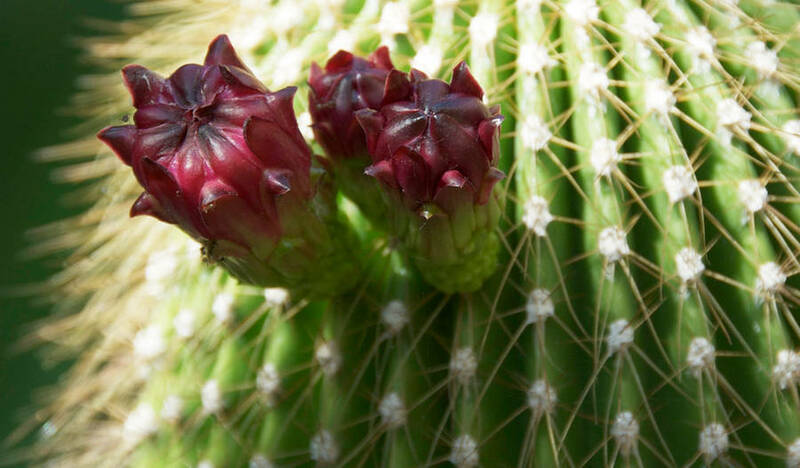 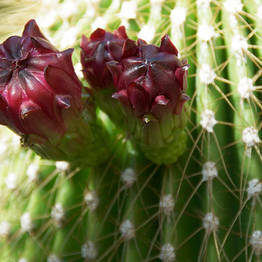 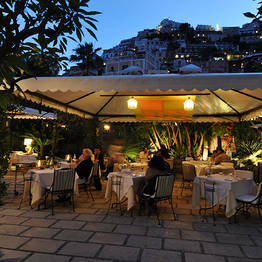 The staff is extremely polite, courteous and friendly." 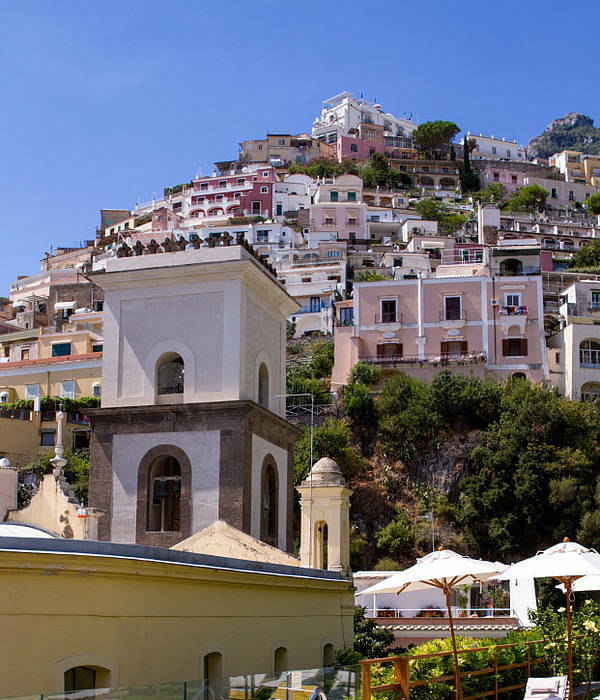 Seen from the sea, Positano seems to defy the laws of gravity: a spectacular pyramid of houses clinging to the rock face and of little lanes which transform into steep flights of steps. 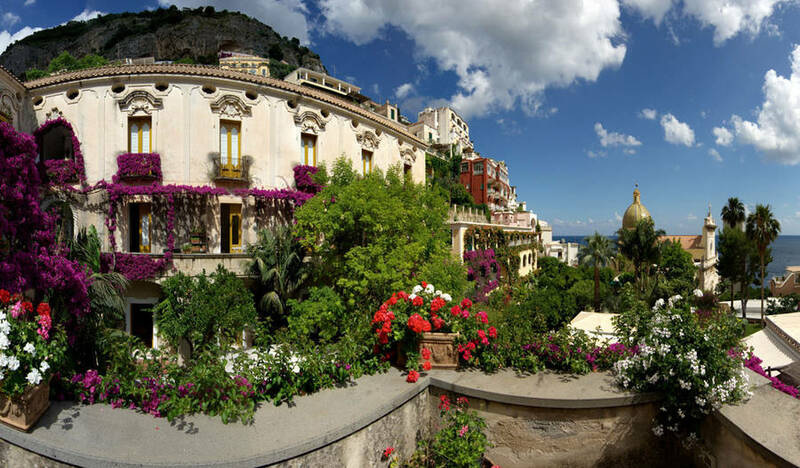 In fact it is difficult to imagine the existence of a garden as large as that which surrounds Palazzo Murat in the midst of such a vertical townscape. 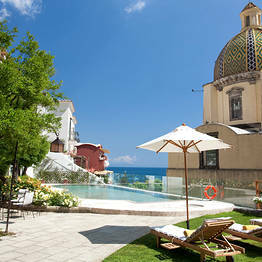 The hotel is located on the pedestrian pathway which from the center of town leads to the beach. 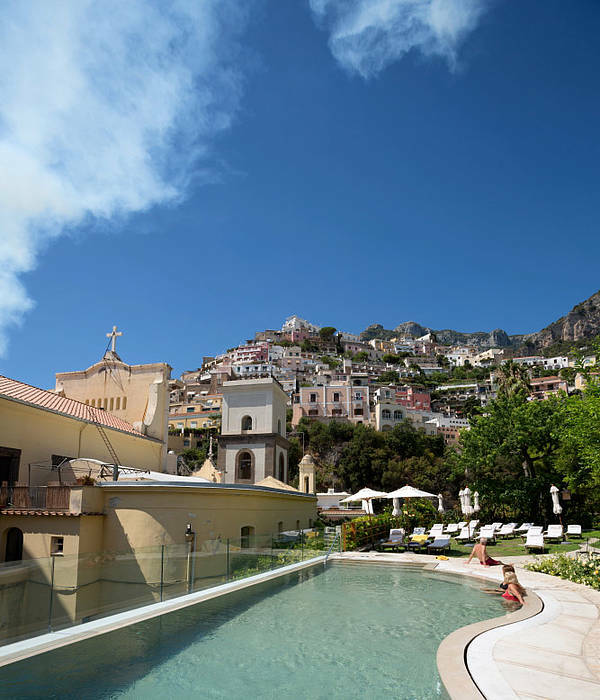 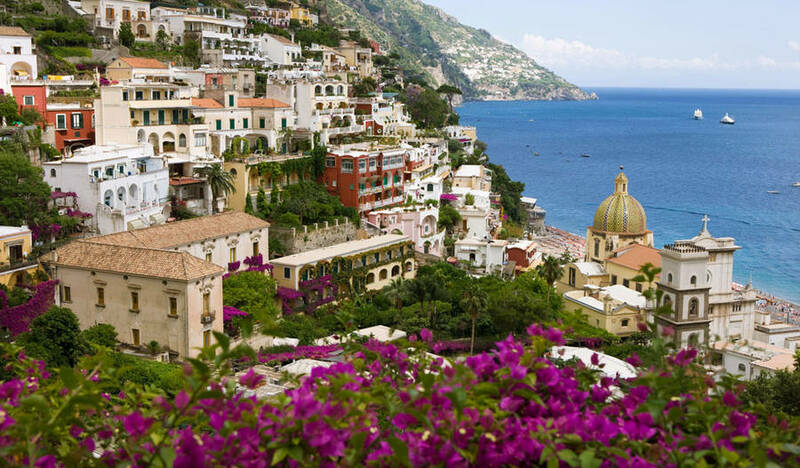 It is only steps away from Piazza dei Leoni and many picturesque little lanes, which are lined with boutiques selling Positano's legendary made-to-measure sandals, brightly colored kaftans and beachwear. 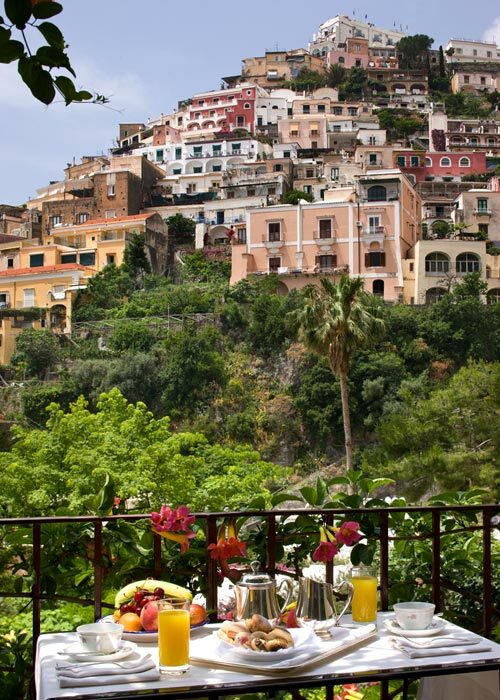 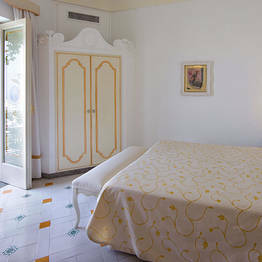 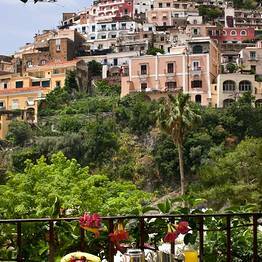 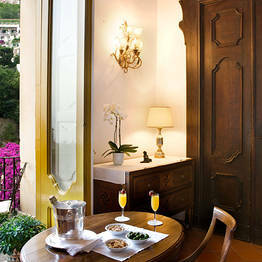 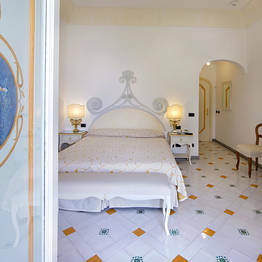 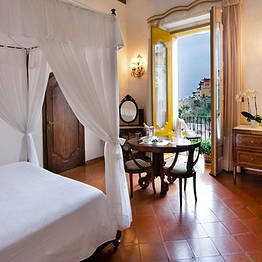 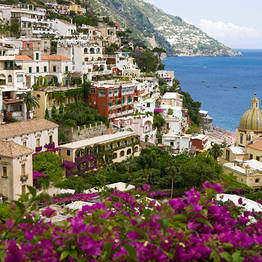 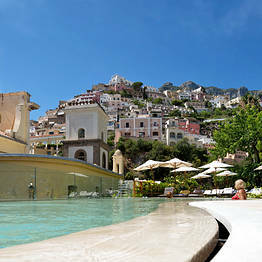 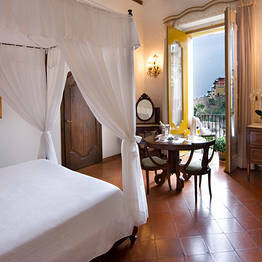 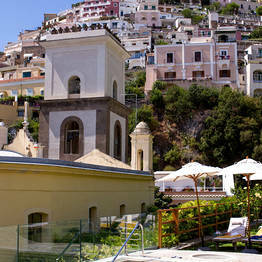 Book Hotel Palazzo Murat on Positano.com now with no additional booking fees.